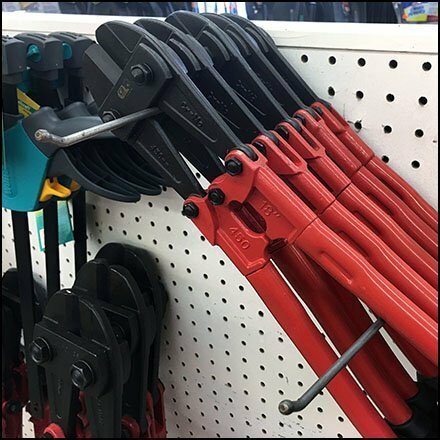 Add a bit of energy and visual interest to even ordinary tool merchandising with techniques like this Bolt Cutter Twin Hook Angled Display. Ordinary rank and file, vertical hangs and facings do permit greater merchandising density, and browsing of complex offerings. But throwing in an angled element or two creates interest. And all that may be required are commonplace Single-Prong, Ball-End Pegboard Display Hooks, as here. This Bolt Cutter Twin Hook Angled Display courtesy of Marks Wholesale, Drums PA.